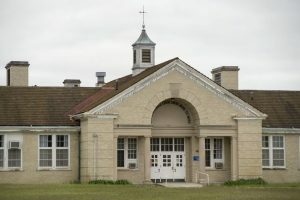 The Caro Center is one of only five state-operated psychiatric hospitals in Michigan. 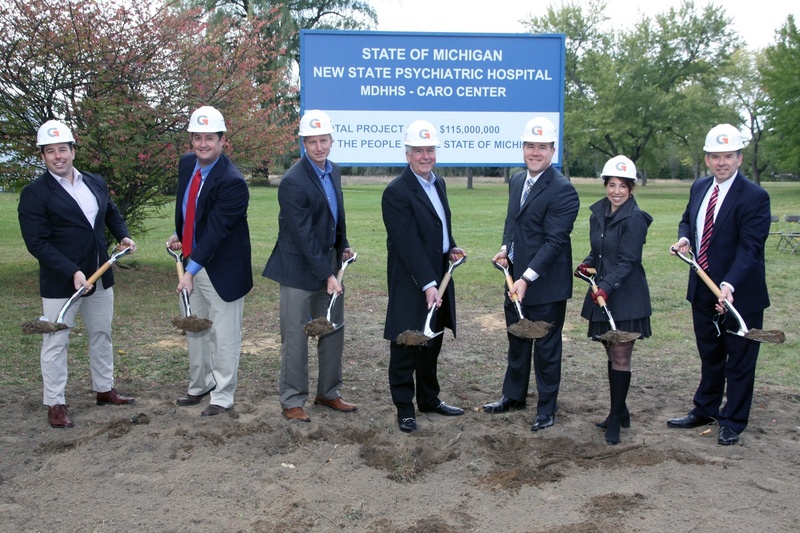 Michigan takes one significant step toward addressing mental healthcare issues as it breaks ground on a new, state-of-the-art psychiatric hospital in Caro, Michigan. This facility will provide patients with improved recovery outcomes in a safer, more welcoming environment, while also addressing the state’s psychiatric facility shortage. There is no argument that there has been a decades-long critical shortage of state psychiatric hospital beds in Michigan and across the country. The Treatment Advocacy Center, a nonprofit working to improve treatment for severe mental illness, recommends 40 to 60 psychiatric beds for every 100,000 people. However, the current national average remains only 11.7. With these numbers, the Treatment Advocacy Center estimates the country needs an additional 123,300 state psychiatric beds, along with more modern facilities and improved treatment programs, to sufficiently meet patients’ needs. 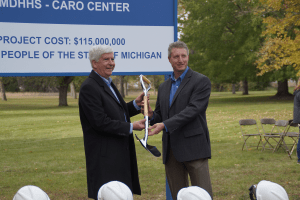 Granger Executive Vice President, Dennis Carignan, presents Michigan Governor, Rick Snyder, with a ceremonial shovel during the historic Caro Center Groundbreaking. As construction begins at the new Caro Psychiatric Hospital, Michiganders pause to celebrate the impact this facility will likely have on improving the state’s care options. On Friday, October 19, Gov. Rick Snyder and other state leaders joined local lawmakers, hospital staff and the community for a ceremonial ground breaking at the construction site. While the Caro Center originally opened in 1914 to care for people with epilepsy, the current facility provides service to adults with serious mental illness from 48 Michigan counties . “We believe the benefits of a new hospital will affect our patient outcomes, our patient and family satisfaction, patient safety, staff efficiency and satisfaction, as well as organizational outcomes,” said Rose Laskowski, director of the Caro hospital. The new hospital is also expected to positively impact the local community, maintaining 360 current jobs and adding at least 100 new positions. Currently, the Caro Center is the second-largest employer in Tuscola County. Granger Construction is honored to play a role in reducing the national psychiatric facility shortage by serving as Construction Manager for the new $115 million Caro Center Psychiatric Hospital. The 225,000 square-foot facility is scheduled to be completed in 2021, and will have capacity to serve 200 adults (with 50 additional beds than previously housed).